The weather was predictied to be south winds with cloud but we had Southwest winds with sunny beautiful skies when we took off. There were lennies in the sky but not as fantastic as later in the afternoon. 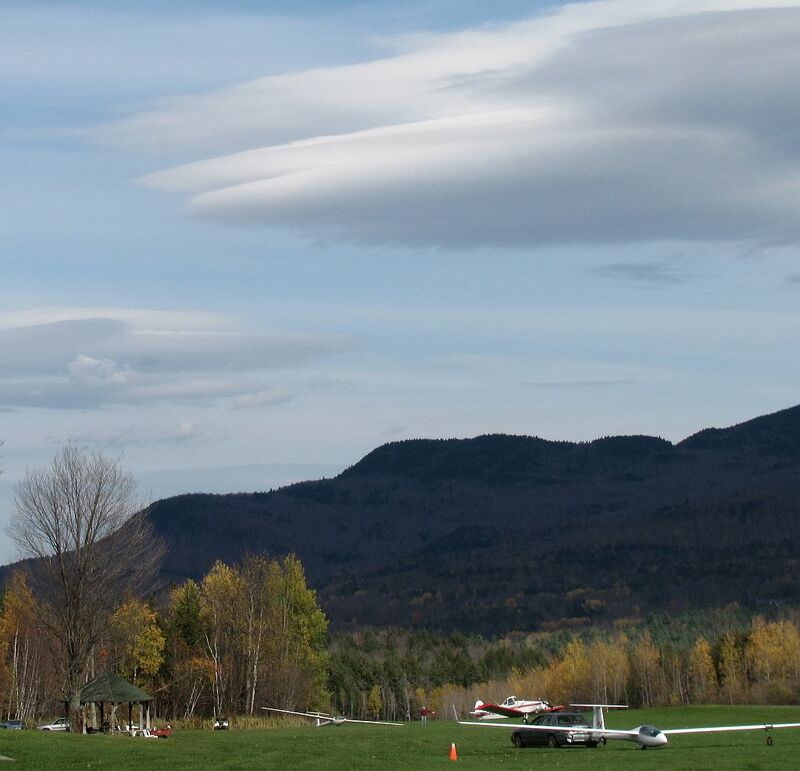 The image below show some of the spectacular stacked lenticular clouds around that day. I have been on the list to have a fight on Sunday when everone except me, flew in mixed conditions. So this day, I was the on the first flight and my pilot in command was Richard Sawyer. We got the DG500 to fly - this was my first experience with this sailplane so Richard handled the takeoff and landing. 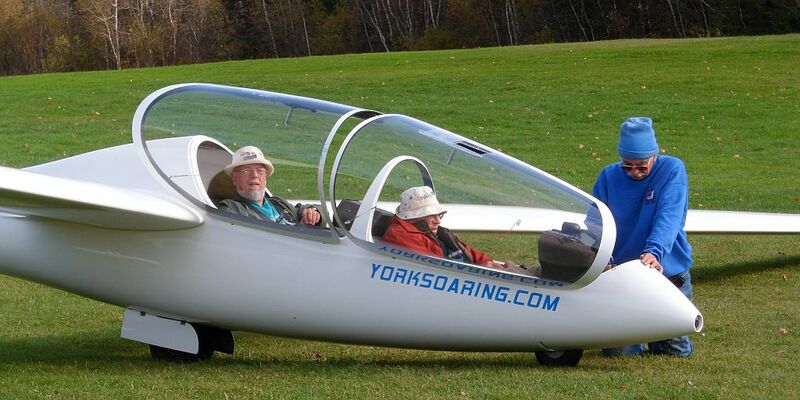 It was an easy glider to fly except that being, in the front seat where I flew, the rudder controls were very sensitive and I had to watch for non-coordinated flight. 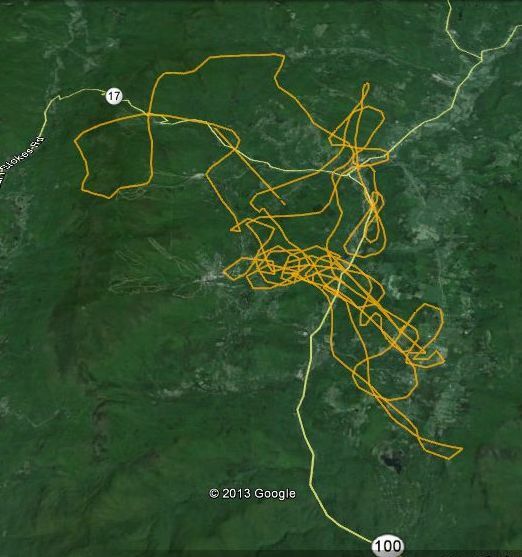 The wind was from the south west and we followed the best part of the lift by flying NW and SE, as you see on the dense part of the tracks. After we got above 10,000 ft the lift increase and we climbed at 4 or more knots. We went to 13,000 (see the height profile below) and could have kept going but other pilots wanted to fly the wave in the DB500 so we pulled the dive brakes and headed down. As part of the descent, I flew forward in the wave over the west ridge into the sind and this increased our rate down. The total flight was a bit less than two hours long. The cloud cover was relaively open when we took off but the wave clouds were very indistinct. This made it more difficult to find the best lift. When we got higher and nearer the edge of the wave cloud, the wave was easier to find. I love the view as we climb the front of the wave cloud. Two views below show what I saw. Click on the images for an enlarged image.